This innovative product from Ecozone hangs easily in any wardrobe and keeps clothes dry and fresh for up to 3 months. 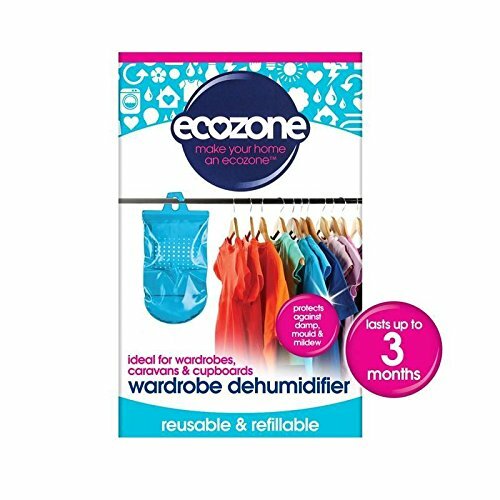 Ecozone Wardrobe Dehumidifier is refillable and reusable, giving your clothes the protection they need at a very low cost. An economical and effective solution to help protect your clothes against the damage caused by damp. Unlike conventional dehumidifiers, Ecozone Wardrobe Dehumidifier will fight mildew, mould and musty smells without using electric power, saving you money on energy consumption. Product advantages: Economical - it works without using electric power. Drastically reduces damp in wardrobes. Refillable and reusable. Lasts for up to 3 months. Easy to fit and use. Suitable to all wardrobes. Approved by The Vegan Society. Non-toxic. BUAV approved. If you have any questions about this product by ECOZONE, contact us by completing and submitting the form below. If you are looking for a specif part number, please include it with your message.